Dr. Lisa Barker is a registered Osteopath. Lisa completed her osteopathic training at Victoria University in 2001. She furthered her studies by obtaining a master’s degree in the biomechanics of sporting injuries. 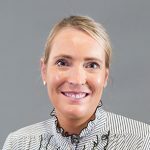 Since completion of her training, Lisa has spent over fifteen years working in private practice in Victoria and New South Wales, in addition to lecturing and supervising Osteopathic Clinical Studies at Victoria University, RMIT, and the University of Western Sydney. Lisa has always maintained a strong interest in sport and hence specialises in the correct management and rehabilitation of injuries. She uses a positive approach and the principles of activity combined with lifestyle changes to manage a patient’s recovery. Lisa believes that by upgrading activity and having the patient become less reliant on passive therapy, they can better aid in their own recovery.